If you read the title feeling confused–don’t worry, you are not alone. As a matter of fact, we had no idea either what was the deal with the Jerusalem artichokes until recently. Sure, we are no culinary experts, but we know a thing or two about food and Jerusalem artichokes were never on our radar. 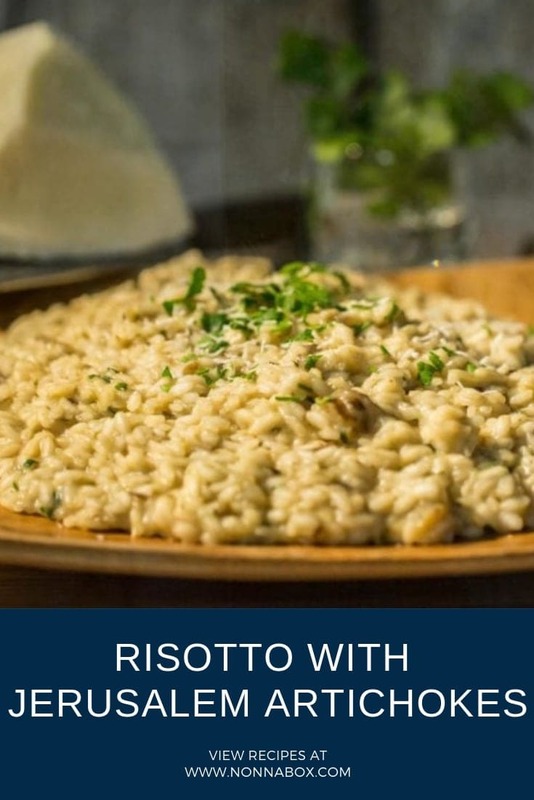 We thought that we needed to start an investigation and in our research, we found out two things: 1) not trying this risotto with Jerusalem artichokes before was a big mistake and 2) Jerusalem artichokes are neither artichokes nor from Jerusalem. What the what? As a matter of fact, these special artichokes resemble small yellow sunflowers more and that’s one of the reasons why you can also find them labeled as sunchokes. Many centuries ago, these sunroots were being cultivated by the Native Americans in the New World and Samuel de Champlain is responsible for bringing this vegetable to Europe. However, it took even more time for it to be appreciated at its real value, as the Jerusalem artichoke went through what could only be described as veggie-shaming. That’s right. People were refusing to eat it because of a tale linking it to leprosy, claiming that the long tubes look liked the fingers of a person suffering from such a disease. How unfair! Okay, but what about Jerusalem? One theory says that it’s just a very, very bad alteration of the Italian word “girasole”, which literally means “turning around the sun” and it’s the name given to the sunflower. Other theory suggests a different type of butchering, but this time of an area, which is Ter Neusen in the Netherlands, where the sunchoke was introduced to Europe. But regardless of its origins, it’s something you have to try with your risotto, because its nutty taste will leave you pleasantly surprised. Wash, scrub and clean the Jerusalem artichokes. Cut the Jerusalem artichokes into cubes and soak it in a solution of water and lemon juice. Heat a saucepan, then add a little olive oil and sauté the diced Jerusalem artichokes. Add salt and pepper to taste, then sprinkle with a little 'dry white wine, maintaining a high heat to let the alcohol evaporate. Lower the heat, cover the pot with a lid and simmer gently for 10-15 minutes, stirring often. If necessary, add a little hot vegetable stock or water when cooking. Meanwhile, boil the vegetable stock. When the artichokes are ready, raise the heat, add the rice and toast for a few minutes. When toasted, add a couple of ladles of hot stock and stir. Continue in this manner, hydrating the rice but often little at a time, for 12-15 minutes or until the rice is soft and creamy. A few minutes before the end of cooking, remove the lid, raise the heat to dry the excess liquid and flavor with grated pecorino romano. Turn off the heat and season with fresh parsley and freshly ground pepper. I had no idea Jerusalem artichokes can be added with risotto, glad I tasted it when I had a meal at a friend’s house. I can now add artichokes next time when I will make this meal. My family will love it just like I did.